I bet that a lot of iOS Users (people who uses iPhone, iPad and iPod) must once in their time with their devices have lost their music. There are some reasons why the one of us may lose their music on their devices. 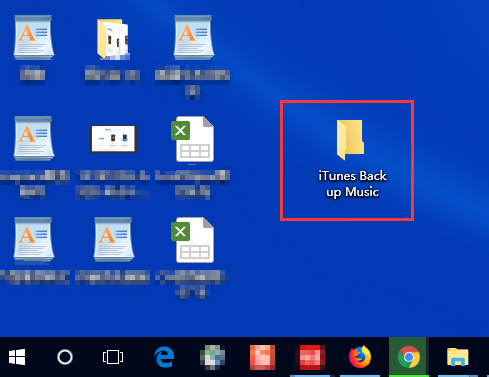 Maybe you lost your music library after a new update from Apple for your current operation system and you forgot make a backup for your library. Maybe you lost the music library of yours because of the new version you just installed. In the end it doesn’t matter how you lost your music. We are here today to help you deal with iTunes lost my music issue. Before we get to how to recover iTunes music from your iDevice (iPhone,iPad) let me talk about iMyFone TunesMate and what makes it a great tool in general for iPhone users. There are some advantages and features that make iMyFone TunesMate to be one of the greatest software for iOS. So let me tell you more about those features. 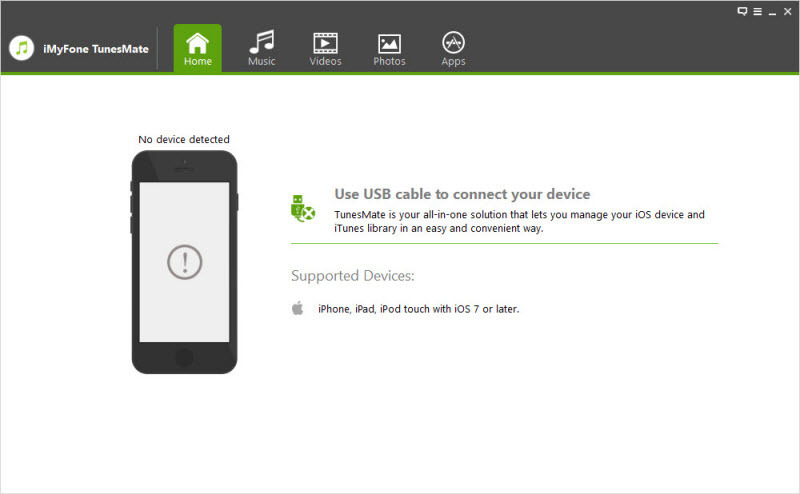 Some and flexible transfer between your iPhone and your computer which you use can be easily achieved using iMyFone TunesMate. 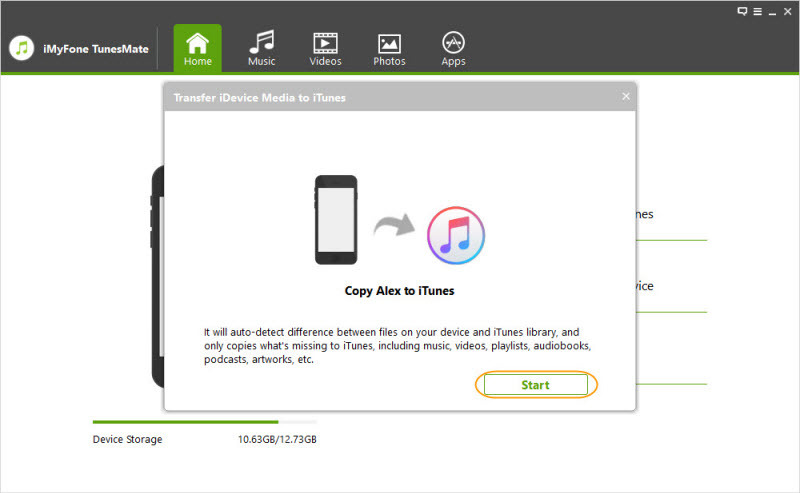 Transfer Media files like music, videos from iDevices to iTunes. You can transfer the library of iTunes without the need of any password. 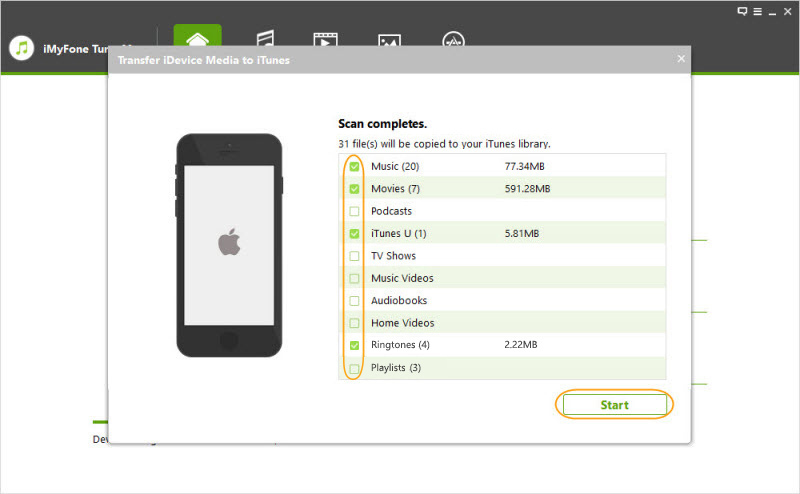 You can easily sync your data without erasing data which iTunes will. Step 1. Launch iMyFone TunesMate. If the USB cable isn’t connected iMyfone TunesMate will give you a reminder of that process. Step 2. When your iPhone of yours is connected, the homepage will show you three options you can choose from it that depend on what you are doing. 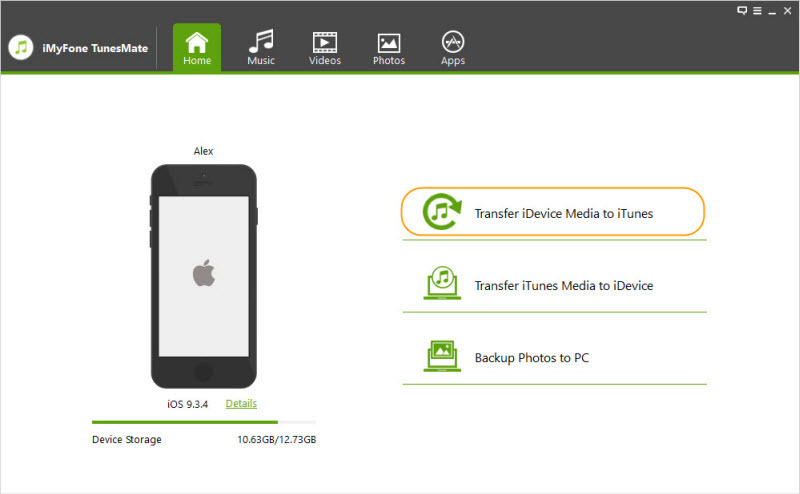 In our case you need to choose the first option “Transfer iPhone Media to iTunes". Step 3. A new window will open in front of you which says “Copy iPhone to iTunes” you will agree by clicking “Start”. Step 4. Now select “Music” and then click “Start” again. Step 5. Wait for a while and once the software shows you that everything is transferred, you can click “Complete”. If you have an old backups of iTunes that contains your lost music and you want to import this old iTunes backup music to the current iTunes that you use. You can do that if you have a backup on your computer or a hard drive, so the backup need to be available on your computer or external drive connected to your computer. We will show you now how to do it. Step 1. Find out where is your old iPhone backups and then copy the music to another folder. This folder can be created on the desktop where is easily to be found. Step 2. Open iTunes. Click "File" on the upper left corner. And then choose "Add File to Library" or "Add Folder to Library". Step 3. Locate the music files or the music folder where you create on desktop. Step 4. Click "Open". The music will be import to your iTunes Libarary. And now you get your iTunes Back. Step 1. Attach the external hard drive that contains the old iTunes backup to the computer. Step 2. Navigate through the hard drive to find the iTunes music folder you backed up to it. Step 3. Drag the iTunes music folder from the external hard drive to the desired location on your computer. In some cases, you may need to put it in the default location used by iTunes. Step 4. 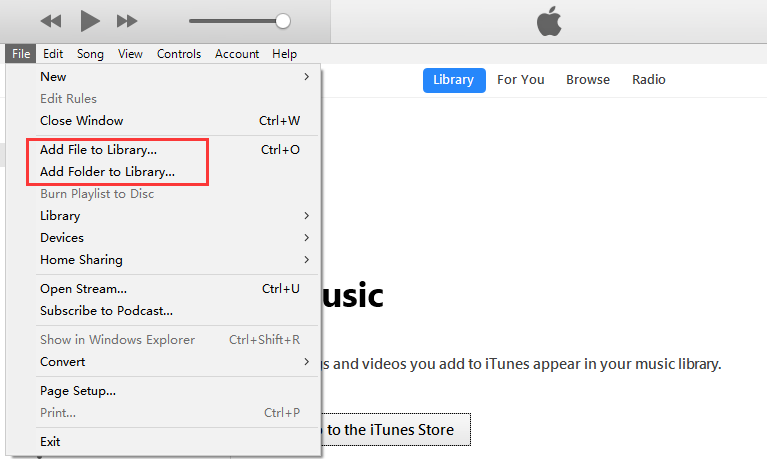 While holding down the Option key on a Mac, or the Shift key on Windows, launch iTunes. Step 5. Click "File > Add File to Library or Add Folder to Library” which is same as the last method. Step 6. In this windows, you can browse through the folder that you copied from the external hard drive. 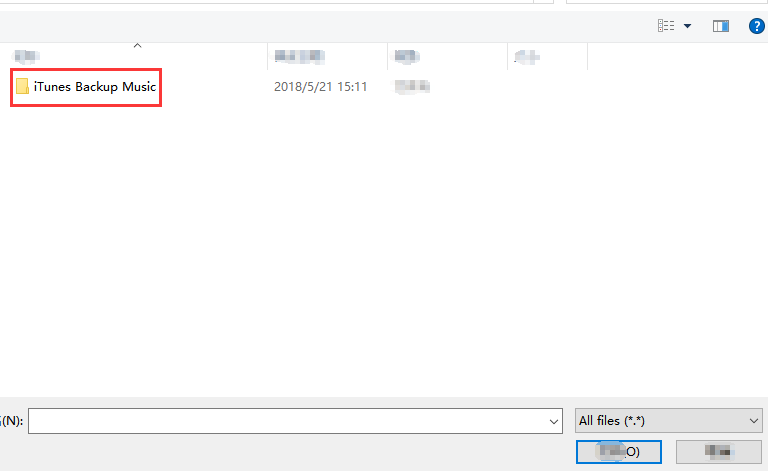 On Windows, select the music file in the folder. Step 8. When it finish. You can now disconnect the external hard drive from your computer.